What Should I Put in My Bag? Our goal: To encourage people to run towards those in their Homeless Community, rather than away from. 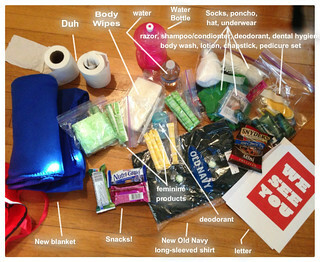 Our mission: To provide one bag, filled with essential items, to every Homeless person in our community. Our Belief: No donation is too small. Whether it's one item, one bag, or one hour of your time, it makes no difference. Even the smallest of gestures can help make someone's day just a little easier. If everyone helps a little, we can help these forgotten people, a lot. What’s in these bags, anyway? Click the photo below for a closer look. I want to buy a bag! I want to donate an item or two! Project: We See You 2013: Homestretch! Project: We See You Welcomes Pomona, CA! Nancy Powell on My Friend and Me.